This entry was posted in Picture Books and tagged Cumulative, Perfect Picture Book Friday, picture book, Rhyme, Susanna Leonard Hill. Bookmark the permalink. I need to find this book! 😀 This sounds super fun! It is super fun! I have enjoyed reading it time and again! 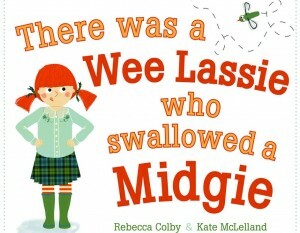 Thanks for sharing ‘Wee Lassie’, Penny! And thanks for sharing Susanna’s list. It has made me hungry for some picture books too! I love that you featured Rebecca’s book here! It’s super fun to be sure! Great pick – looks so darling and fun – for kids AND parents! Great stuff- thanks! It is all kinds of fun. Thanks for stopping by, Joanne! Love this, so catchy, great illustrations and one can’t wait to see what she swallows next. Must say loved the Teachers Guide. Rebecca and Kate have really run with it in a big way, activities, guides, classroom discussions etc…. I have made a note of their website, great food for thought to keep in mind. 😉 Excellent choice Penny. Isn’t the teachers guide incredible??? I think she did an amazing job! I’d love to read a Scottish vetsion amd tray out that accent. How fun! The repetition and rhyming will enchant kids. I can just hear kids repeating the words faster and faster and then gasping for air. Love this choice. Such an entertaining choice. It is entertaining. I really love repetition when it’s done well. Kids just smile when they get to join in. This looks hilarious!! I liked those bagpipes! Thanks for sharing this one! Yes, the bagpipes were excellent for the trailer. They made it so enjoyable and Scottish!